In a massive show of strength that analysts said was meant to reassure nervous allies in the Asia-Pacific region, the U.S. Navy deployed two aircraft carrier strike groups for an exercises in the Philippine Sea on Saturday. The exercises, which came ahead of a key international court ruling on China’s claims in the disputed South China Sea, brought together the USS John C. Stennis and USS Ronald Reagan, and featured over 12,000 sailors, 140 aircraft and six other ships, according to a statement released by the U.S. Pacific Command. The strike groups conducted air defense and sea surveillance drills in the Philippine Sea, in the Western Pacific, near the South China Sea. U.S. Navy aircraft carriers have conducted dual carrier strike group operations in the Western Pacific, including the South and East China seas and the Philippine Sea for several years, the statement said. “As a Pacific nation and a Pacific leader, the United States has a national interest in maintaining security and prosperity, peaceful resolution of disputes, unimpeded lawful commerce, and adherence to freedom of navigation and overflight throughout the shared domains of the Indo-Asia-Pacific,” the statement added. The timing of Saturday’s operations comes as the Washington’s Southeast Asian allies eagerly await a ruling from the Permanent Court of Arbitration in The Hague on a case filed by Manila against Beijing’s so-called nine-dash line claim to much of the South China Sea. The arbitration court is widely expected to rule in favor of the Philippines in the coming weeks or days. China has not taken part in the case and has vowed to ignore the ruling, saying the court does not have jurisdiction over the issue. An unidentified source told The Manila Times on Wednesday that the court would announce its ruling in the case July 7. Observers had initially said the ruling was likely to come at the end of May. China claims almost all of the energy-rich waters of the South China Sea through which more than $5 trillion in trade passes each year. Aside from the Philippines, Brunei, Vietnam, Malaysia and Taiwan have overlapping claims. Beijing’s massive land-reclamation program in the contested waters, and U.S. claims of that it is militarizing its outposts in the area, have prompted Washington to conduct what it calls “freedom of navigation exercises” near the Chinese-controlled islands. “Combined exercises by two carrier strike groups certainly send a message about America’s strategic commitment to the Asia-Pacific region and its unrivalled capacity to project naval power,” said Ashley Townshend, a research fellow at the United States Studies Centre at the University of Sydney and visiting fellow at Fudan University’s Asia-Pacific Center. Townshend said that drills such as this and recent military deployments to the Philippines and Singapore, as well as the normalization of U.S.-Vietnam defense ties, signal to Beijing that Washington is serious about upholding freedom of navigation for military ships and aircraft. “This large-scale show of American power is also about reassuring anxious Asian allies and partners about Washington’s resolve and security guarantees in the region,” he said. Still, analysts including Townshend say too much should not be read into the timing of the latest drills. “They’re not explicitly tied to the arbitration at The Hague,” Townshend said. 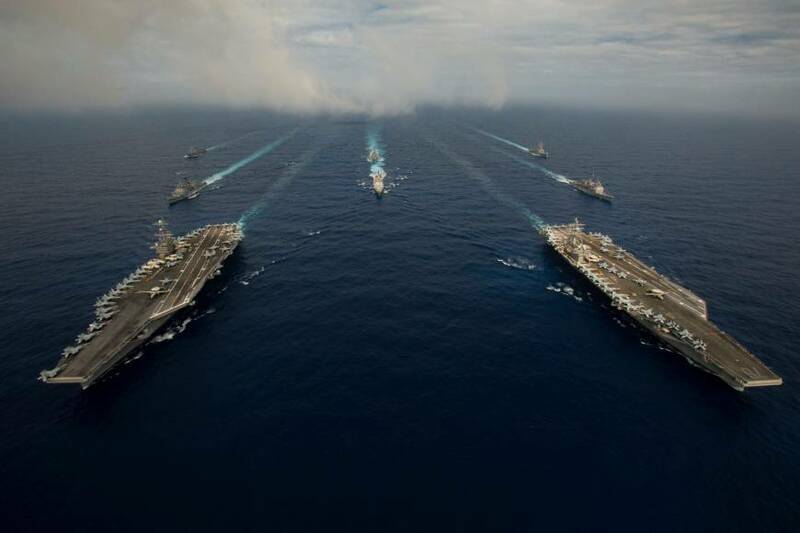 Rather, said Euan Graham, director of the International Security Program at the Lowy Institute in Sydney, the U.S. Navy is attempting more complex “big unit” maneuvers in the Pacific for strategic reasons — including practicing ways to better integrate the 7th and 3rd Fleets. “The Philippine Sea is where U.S. carriers are more likely to operate under real crisis or wartime conditions, safely out of range of China’s ballistic missiles and other coastal-based area-denial capabilities,” Graham said. “If there is a political ‘signaling’ element to such an intense level of exercise activity, it is more likely to be intended to pre-empt any opportunism by China and all-comers now that the U.S. has entered the lame duck period of (Barack) Obama’s presidency,” he added. By contrast, analysts say the U.S. deployment of “Growler” electronic warfare fighters to Clark Air Force Base in the Philippines last week, and its placement of A-10C “Warthog” attack planes there in April, are a more direct signal of Washington’s commitment to Manila ahead of the court verdict. Four of the A-10Cs flew through international airspace in the vicinity of the disputed Scarborough Shoal — just 230 kilometers west of the Philippines — in April. The shoal, a key flash point, is seen as a site where Beijing may carry out further land reclamation in the event of an unfavorable ruling by the arbitration court. 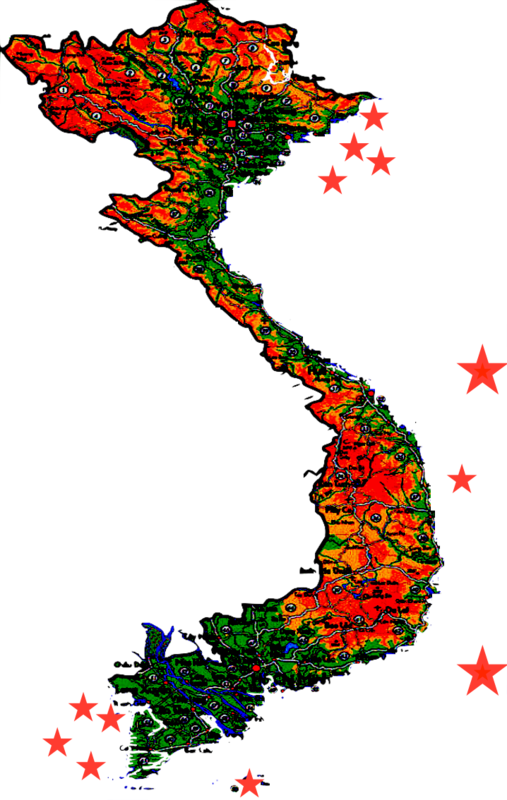 But instead of deterring such a move by China, the recent deployments and exercises by the U.S. could have unintended results. “These signals … have not been accompanied by explicit assurances by Washington that the Spratly Islands and Scarborough Shoal fall under the U.S.-Philippines Mutual Defense Treaty — raising the possibility of mixed messages in American signaling to China about its red lines in the South China Sea,” Townshend said, referring to the Spratly archipelago, parts of which are claimed by six nations.